I enjoy cooking much more in the winter months, especially when it’s too cold to venture outside. There’s something so cozy about a warm kitchen filled with the scent of good foods bubbling on the stove or roasting in the oven. We like to invite family and friends over for a meal to break the monotony of short, cold days. And February has some special events to turn into a celebration. Valentine’s Day is traditionally a “dinner for two” meal. It doesn’t have to be fancy – but it should be delicious! 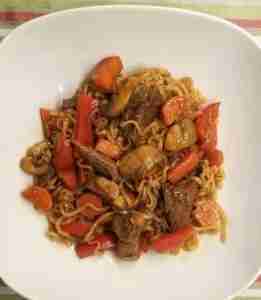 The recipe below for Garlic Beef and Veggie Ramen is fast, tasty – and inexpensive. Chinese New Year also falls in February this year. In the Chinese calendar, 2019 is the Year of the Pig. Although this recipe uses beef, you can easily replace it with thinly sliced pork tenderloin. Tip: Assemble ingredients and measuring tools on counter before cooking; this is a quick recipe! 2 cups assorted chopped vegetables of your choice: any color bell pepper, mushrooms, snap peas, shredded carrots, etc. 1. Marinate flank steak with 3 tablespoons tamari sauce, hoisin sauce, 1 clove minced garlic and 1 teaspoon corn starch. 2. Boil water in medium saucepan; add ramen noodles and one seasoning packet. (If you prefer, cook ramen in beef or chicken broth.) Reserve one cup of seasoned water/broth before draining noodles and set aside. 3. Meanwhile, saute vegetables in skillet with 1 tablespoon canola oil until crisp-tender, then transfer to medium-size bowl. 4. In the same skillet, add 1 tablespoon canola oil and add marinated meat in a single layer. Cook without moving until the beef is well-seared, about 1 minute. Continue cooking while stirring until the beef is lightly cooked but still pink in spots, about 30 seconds. Transfer to bowl with veggies. 5. In same skillet, add chili/sesame oil, 3 tablespoons tamari sauce, 1 clove minced garlic and brown sugar; stir until garlic is cooked. 6. Whisk 1 teaspoon cornstarch into the reserved ramen broth, then add to skillet, stirring over medium heat until sauce thickens and reduces just a bit. 7. Add reserved meat, veggies and ramen noodles to skillet, tossing to coat. If desired, top each serving with cracked black pepper and red pepper flakes.